In between celiac disease and alleged intolerances sometimes diagnosed by reading the hand, there is another form of trouble caused by gluten: the much more frequent gluten sensitivity. Gluten sensitivity is not clearly identified yet and we still know little about it. Anyway it has been the subject of several scientific publications and discussed at the 14th International Coeliac Disease Symposium in Oslo, in June 2011. Celiac disease and gluten sensitivity can be similar but actually they are completely different. By eating gluten we get sick, symptoms can vary from person to person: diarrhoea or constipation, sleepiness, headache, anaemia, abdominal pain. These symptoms are common both to the celiac disease and the gluten sensitivity. Getting a blood test we see that our antibodies are altered and our intestine is badly inflamed. This is typical of the celiac disease, not of the gluten sensitivity (in this case the intestine can be a little inflamed). If we go on a gluten free diet, we start feeling better and the symptoms disappear. This is common both to the celiac disease and the gluten sensitivity. 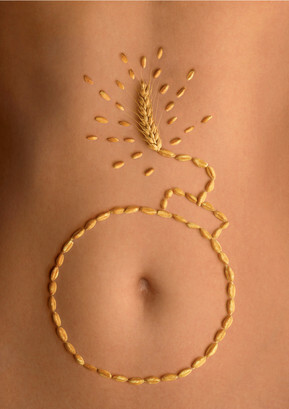 But celiac patients need more time to recover as they get more damages by eating gluten. Once we understand that we don’t have celiac disease, we can start to focus our attention on the gluten sensitivity issue. Some weeks ago a kind of “household” test about gluten sensitivity was launched on the market, most people consider it not reliable because it does not identify the criteria to understand if it is gluten sensitivity or not. We shall not forget that the diagnosis is a medical practice and has to be followed up by a doctor; it can’t be something that we decide by ourselves with a kit bought in a shop! It is clear that today many people are suffering from gluten but please be careful not to become hypochondriac. Eating gluten free has to be taken seriously, it is not just a food trend like another: going gluten free is a true life safer for celiac people and it can really help other people to improve their health conditions and feel better about themselves.